SHINE is ready to custom-manufacturer your next flat ribbon cable assembly. We use automated tooling, employ a highly-trained workforce, and are committed to quality. Learn more about our capabilities. What are Flat Ribbon Cable Assemblies? Flat ribbon cable assemblies consist of ribbon-like planar cables with a flat, rectangular shape. The wires or conductors run parallel to each other. With their distinctive shape, flat ribbon cable assemblies can be folded into space-saving configurations. Typically, these custom cable assemblies are used as interconnects for internal peripherals. Flat ribbon cable assemblies are specified by the number of conductors, and by the spacing or pitch between the conductors. The wires are made of stranded copper and specified by AWG. Flat ribbon cables are ideal for insulation displacement connectors (IDC), but can be terminated by crimp contacts or soldered connections. 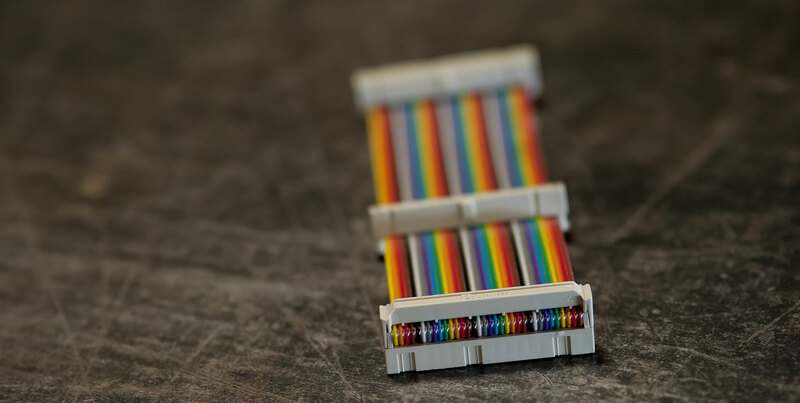 Rainbow ribbon cables use color to provide visual identification for the conductors. At SHINE’s manufacturing center in Adams, Massachusetts, skilled personnel use state-of-the-art equipment to produce flat ribbon cable assemblies to the highest quality standards. In addition to custom cable assembly services, we provide engineering support such as design assistance and component sourcing. Flat ribbon cable assemblies are used with computers, printers, CD drives, and other internal connections in electronic devices and equipment. SHINE is an ISO 9001:2015-certified manufacturer specializing in custom cable assembly, wire harnessing, and electro-mechanical assembly. Since 1984, we’ve been providing partners with wire and cable products that exceed their expectations. How can we help you? Contact us for more information about flat ribbon cable assemblies.